Bikes + System = Let's Ride! Want to share? We can help. We design and build custom fleet bicycles for bike sharing programs. Our bikes are designed to be unisex, low-maintenance, and super cool. We also offer cutting edge bike sharing systems perfect for small companies and trusted communities. Create a pool of bicycles for your office, building, residential complex, college or community. 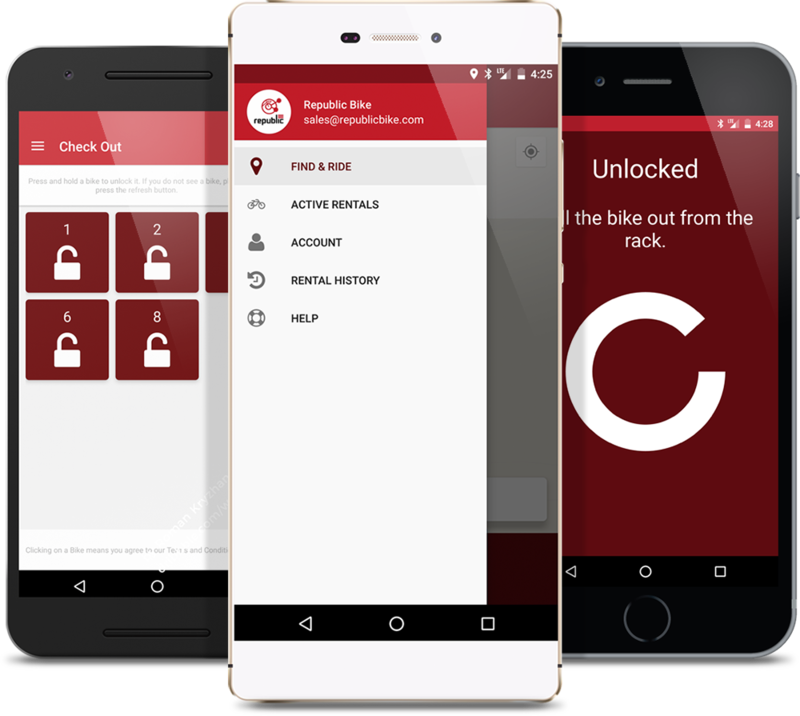 A complete bicycle sharing solution for our custom fleet bicycles with electronic locking hardware, a custom smartphone application and an administrative back end. 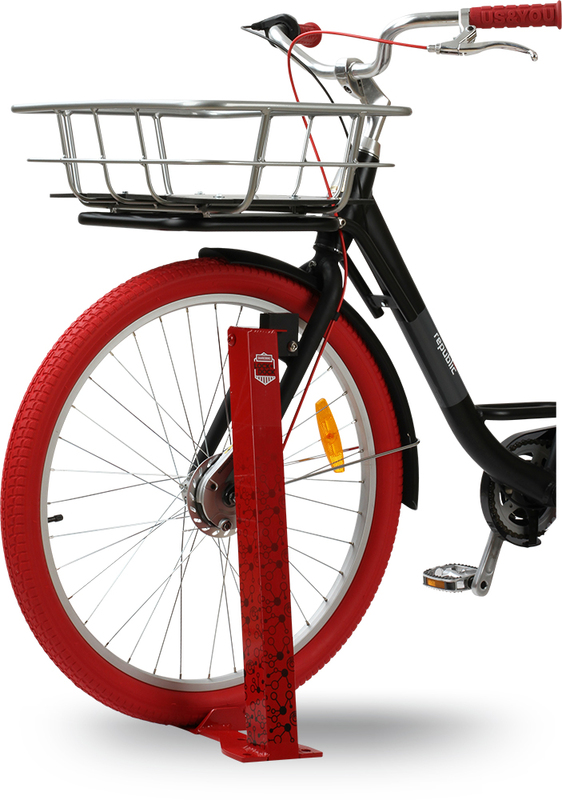 Our SHAREDBIKE LOCK+DOCK system adds intelligence and locking capabilities to your custom fleet. Now you have everything you need to start your own bike share. A total package to make setting up bike share simple and affordable. Use the app to find the nearest bike station. At the station, use the app to unlock your bike. Rental rates are determined by your plans and pricing. To end a rental, securely return the bike at the nearest dock. SHAREDBIKE LOCK+DOCK employs solar powered, Bluetooth smart locks mounted on our custom fleet bicycles. The bikes can be checked out with the rider's smartphone on an app custom designed for each bike share program. The customizable SHAREDBIKE App is how riders access their bike share program. With this app, members of the bike share can: check-in and check-out bikes, find available bikes at bike stations, manage their user account, and track their usage. We include software that gives the tools you need to run a successful system. Our software makes it easy to get the information you need to run a system within a single dashboard. We make vital statistics simple to understand so you can keep bikes on the road. 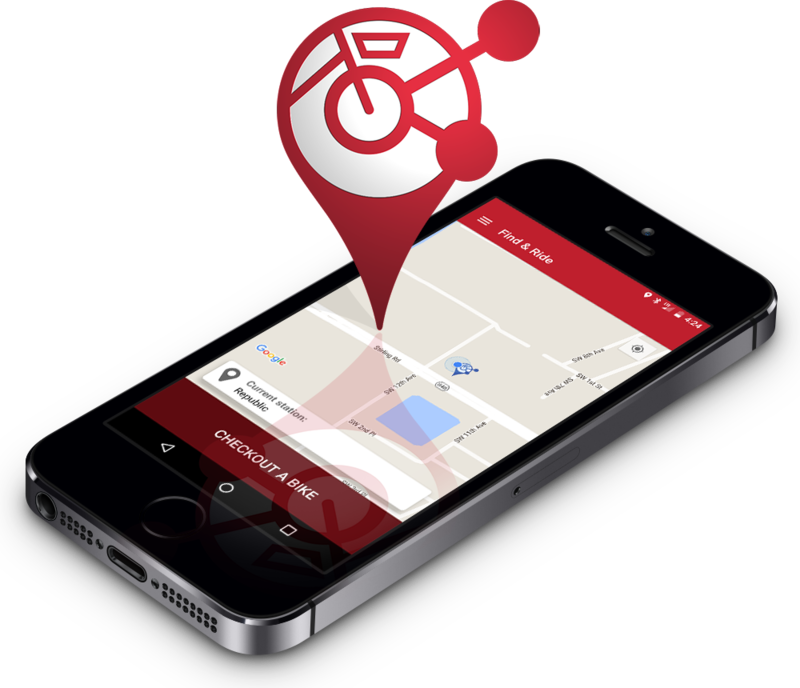 Realtime information on the location and state of bicycles. Email and admin authorization on system access and plan purchasing. Statistics on health and environmental impact. Analytics and visualization of key metrics to help manage and grow the system. Customizable plans that allow free rentals, free time, selective access, and other charging methods. Integrated credit card processing and direct deposit. A comprehensive range of billing options allow you to build plans that are just right for your system. Email confirmation or administrative approval can restrict plan and system access. Riders sign up for a riding plan directly from the app. Pay as you go with this plan. It all starts with the bikes. Our SHAREDBIKES are designed specifically for fleet orientation and sharing. They're comfortable, unisex and low-maintenance (and super cool). We have loads of options, so get in touch and we'll help design your own fleet today. 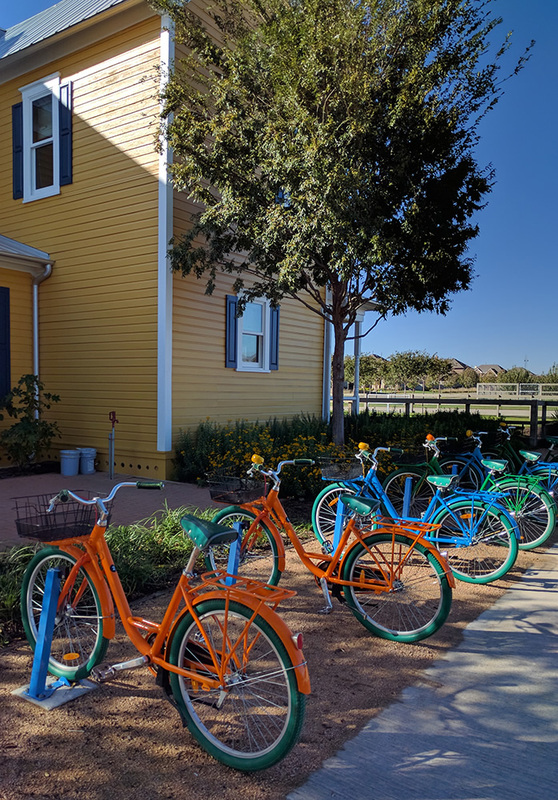 Located on the 1,150-acre historic Faught family farm in Argyle, Texas, Harvest empowers smart living with its very own bike share. A $1 billion, master-planned development by Hillwood Communities, Harvest is the progressive development company’s first "Live Smart Community." Every detail was designed with sustainability, clean living and smart technology in mind. Homeowners enjoy their own Saturday farmer’s market, community garden, on-site farmer and horticulturalist, along with bike and hiking trails. Hillwood Communities sees bike share as an essential amenity to empower people to Live Smart. 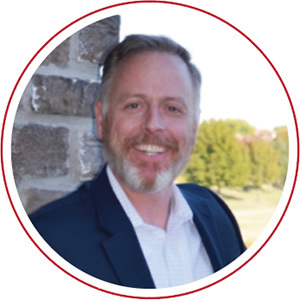 The company wanted a solution that was eco-friendly, scalable, low-cost, and simple to implement, with very little maintenance required. 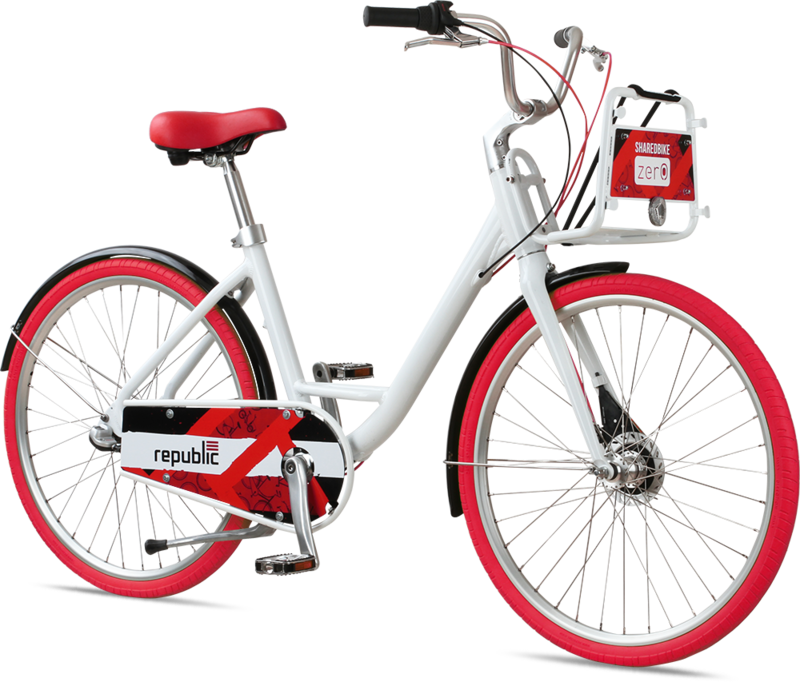 Republic Bike’s SHAREDBIKE LOCK+DOCK solution fit their values and their budget. The first fleet of bikes were stationed right outside the Farm House, at the heart of the community. 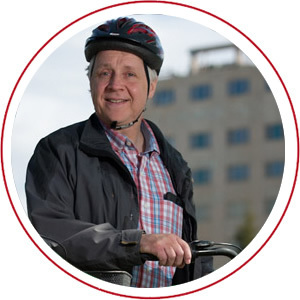 "Our homeowners love the bikes," according to Tim Mills, General Manager. "They come by the Farm House after moving in, and they immediately want to know about the bikes. It’s a great amenity." "We have kids who ride their own bike to the Farm House to check out the Harvest Bikes," said Paige Austin, Lifestyle Manager. "People like they don’t have to make room for their own bike in their garage. Plus when their grandchildren come to visit, they can ride together." David McKie has been renting bikes out of a garage on Onondaga Lake for 20 years, but wanted flexibility in hours and location. "For years, I've had people say, it'd be nice if I could take a bike out and leave it at the other end," McKie said. When he saw the municipal system in New York City, he was inspired. But when it came time to evaluate his options, he was disheartened by the cost and complexity. Then David found Republic Bike’s SHAREDBIKE LOCK+DOCK solution: a low cost, simple to implement, solar powered system, with virtually no maintenance, and quickly jumped on board. Bikes and stations were put in service in a few months for the first rental season. "Millennials love that everything can be done right from the app. I love that I don’t have to have any staff to run it." 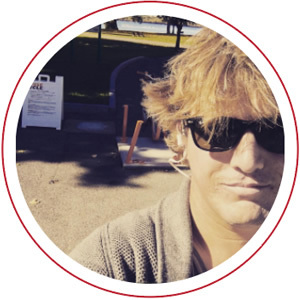 "I love the flexibility in moving stations to drive more traffic. I just have to plug in the latitude and longitude, and the system knows where the bikes are. Then people download the app, rent and go. It really is amazing," McKie said. CUSE Cycle is expanding their program and stations, with plans for expansion along the Canal Corridor in the future. 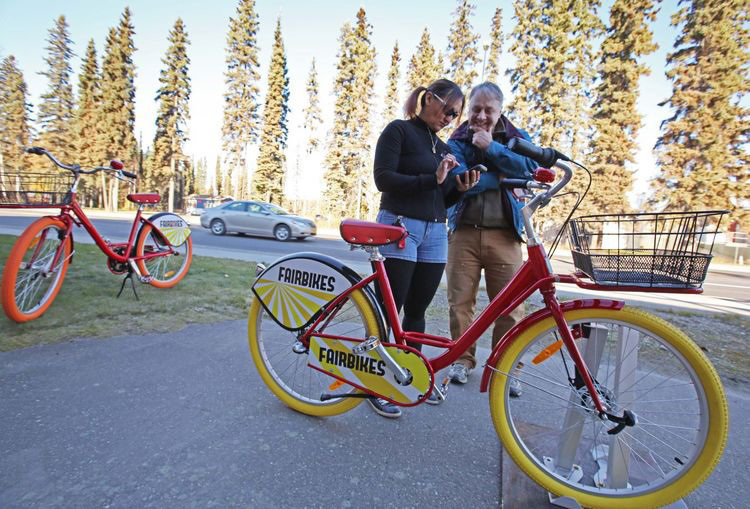 The town of Fairbanks Alaska, with less than 33,000 in population, and seasonal snowpack, was an unexpected early adopter of flexible bike share. But John Stowman and Jennifer Eskridge, long time recreational cyclists, had a dream and the entrepreneurial spirit to make it happen. Why not Fairbanks? And the idea for Fairbikes was born. After being selected as the winning idea at a local startup weekend, Fairbikes officially incorporated on Halloween, 2013. John and Jennifer attended 25 community events, doing their own consumer discovery through community interviews. Without a doubt, there was a market for bike share in Fairbanks. Trouble was, they had a math problem. With a density of 13 people per square mile, and the average cost of a big-city bike share kiosk running $50,000 for a pretty permanent structure that couldn’t be moved in the winter, it didn’t add up. "We quickly realized the kiosks had to go, and we needed the tech to be on the bikes," said Jennifer Eskridge, co-founder Fairbikes. "And, we wanted the bikes to be visually awesome, to attract the eye of tourists and sponsors." It was a winding road to find the perfect solution. But just as Fairbikes was nearing their launch, the Republic Bike SHAREDBIKE LOCK+DOCK became a possibility. Finally, combining tech on bike, with awesome looking bikes. Plus, the entire system was solar powered and flexible enough to bring in for the winter, and scalable enough to move and add stations. "When it got to the point the tech was on the bike, and it was affordable enough for two crazy entrepreneurs in Fairbanks, we had to go for it." -- John Stowman, Fairbikes co-founder. 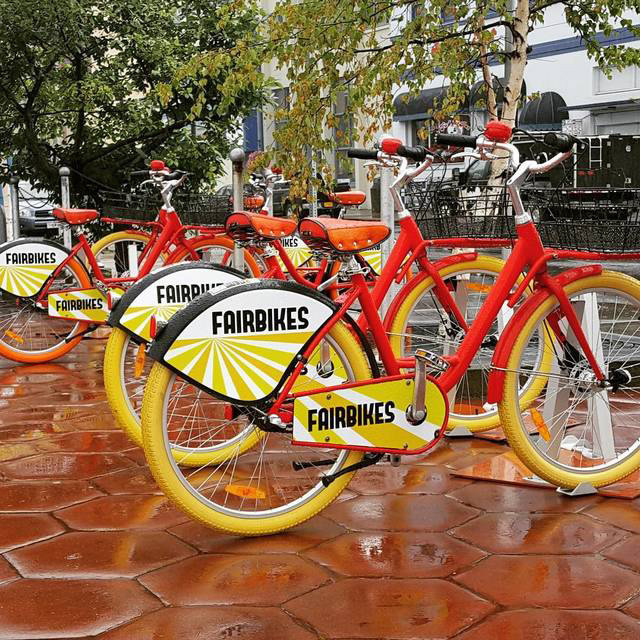 Fairbikes set up their local bike share with revenue streams from Annual Membership, Daily Usage Fees, Local Business Station Sponsorship and Digital Advertising. Their pricing structure is designed to help increase local business. No matter how many times you stop and start, the first 60 minutes is free - encouraging people to get off, stop-in, grab a few things, and keep on riding. They found people on bikes traveling at human speed tend to interact more with the local community - pedaling $7-$14 into the local economy for every ride that sets out. Since its official introduction in May 2016, Fairbikes has racked up thousands of members and rides. They've engaged local business sponsors, and the University of Alaska Fairbanks Office of Sustainability has purchased subscriptions for their students and staff. With the success of Fairbikes, the team is looking roll into other towns in Alaska soon. Copyright © 2019 Republic Bike Inc.
All Rights Reserved. Republic, Built by us & you, Bikes for BIZ, Aristotle, Plato, and Socrates are registered trademarks of Republic Bike Inc. BLOOM is a registered trademark of BLOOM Sharing Technology LLC. Other marks are the properties of their respective owners.